In Santa Monica’s multi-modal community, city planners are interested in getting people out of their cars and onto bicycles and walking. But where do electric scooters fit in all of this? These scooters are rented via the Bird app and the model is very similar to Breeze bikes. Residents, commuters and tourists can rent the scooters through the app. The difference between Birds and Breeze bikes is that riders can simply abandon the Birds anywhere, instead of at a designated station. The Birds are safe due to a locking system in the app. Van Zanden initially recommended riders obey the same laws as cyclists, but a recent crash between a Bird rider and a car has Santa Monica Police Department thinking about the scooters differently. In Santa Monica, cyclists are required to wear helmets if they are under 18. For those over 18, it is recommended that you were a helmet, but not a law. California state law states that anyone operating a motorized scooter must have a valid driver’s license or instructor permit and wear a helmet, so the motorized scooter law is different from the rules of the road for bicycles. Additionally, the law states that riders cannot abandon scooters on public sidewalk if it impedes pedestrian traffic, which some Bird riders have done. Lastly, the SMPD stated that Bird scooters cannot be ridden on public sidewalks with the exception of crossing one to obtain entrance to a driveway or parking lot. These rules are listed on the Bird app. Police are now stopping riders who are breaking the law. At this point they are simply educating them about the law and giving them warnings, but tickets could be coming soon. The fine for riding without a helmet is $190. The fine for riding a scooter under the influence is $352. It hasn’t been stated what the fine for abandoning the scooter on a public sidewalk and impeding pedestrians will be. 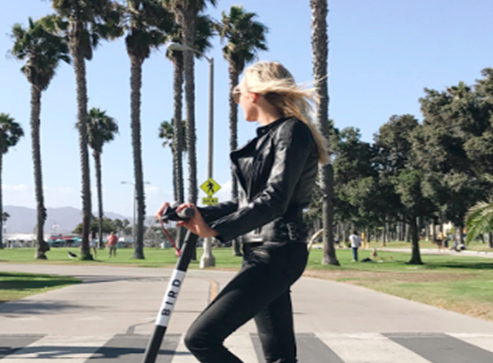 In a quest to keep people from traditional means of transportation (cars), Santa Monica is providing alternative means of transportation include the Expo Line, Breeze bikes and now Bird scooters. Each has positives and negatives associated with them. As the public becomes more aware of the choices and the rules of the road for each, Santa Monica will likely see more of the positives, but for now there are still many unanswered questions. What’s your Immigration & story? Good job with this story!